Real lessons from online review sites. How Suncoast Credit Union leveraged previously untapped benefits. Doug Fecher, CEO of Wright-Patt Credit Union, talks about leadership styles and what it takes to be the driving force behind a credit union. 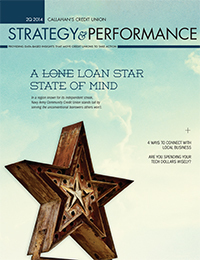 How do credit unions in Texas stack up against the nation? Clever acronyms and marketing buzzwords can only take a brand so far. That's why Navy Army Community Credit Union has spent the past 10 years taking action that speaks louder than words. Lessons learned during an expansion into Texas' Rio Grande Valley have informed policies and practices throughout the NavyArmy footprint. Lending in South Texas might be riskier than some institutions' appetites allow, but NavyArmy enjoys a little spice in its portfolio. How the right mix of staffing, incentives, and process improvements at NavyArmy buoy this seaside institution's bottom line. NavyArmy witnessed a year of growth and change in 2013. Now, CEO Sarah O'Brien is preparing to steer the credit union into its next phase of development. Download the Anatomy Of Navy Army Community Credit Union PDF. Cultivating tomorrow's MBL success starts with serving a wider spectrum of borrower demographics and business needs today. Incubators and other like-minded organizations help credit unions connect with entrepreneurs and new businesses. Self-Help's independent loan fund allows it to meet the needs of underserved borrowers without creating undue risk. Northern Credit Union in Ontario, Canada, uses crowdsourcing to rally the community around philanthropic missions. Veridian Credit Union shares four rules for venture capital investment. The annual Technology Priorities Survey from Callahan & Associates reveals how cooperatives are building better digital interactions with their membership, one click and tap at a time. Next-generation strategies for organization, accessibility, and content can transform an aging channel into a vibrant one. How credit unions are using payments, loan applications, and location-based offers to build a big user experience in a small delivery channel. Just like in the classic Atari game, a solid offense is the best way to defend against outside companies coming between you and your members. Our parents might have taught us not to judge others by their appearances, but an institution's dress code has far-reaching effects on its success. Four ways credit unions are working their wardrobes in support of a larger cause. Do you know your industry's CEOs? Test who and what you know with this quarter's crossword puzzle.